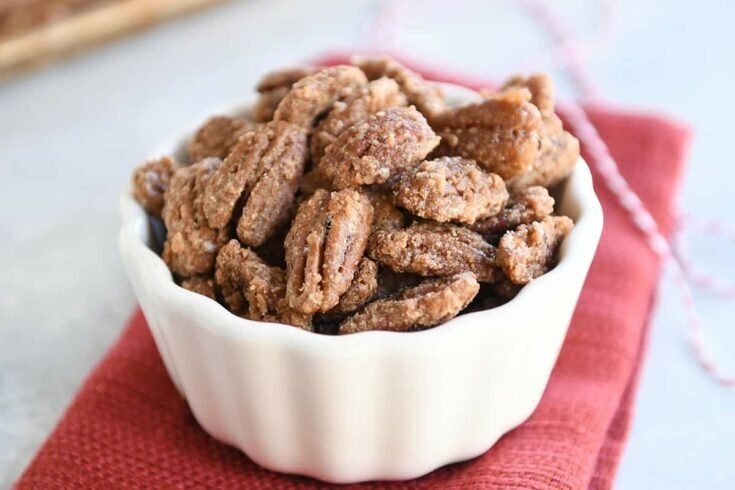 Naming these easy cinnamon and sugar candied pecans as ultimate favorite holiday recipe this year is so, so tempting as I’m writing this. And I would do it. I really would! Except for a magical cookie recipe I’m going to post next week. 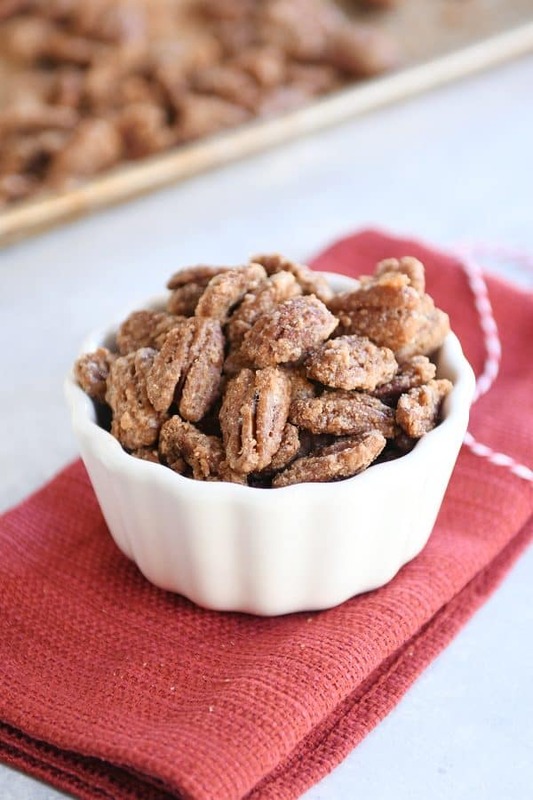 So in an effort to remain calm and collected, instead I’ll just say: IF YOU DON’T MAKE THESE CINNAMON AND SUGAR CANDIED PECANS, YOU ARE QUITE DECIDEDLY A BIT CRAZY AND MUST NOT WANT MAXIMUM JOY IN YOUR LIFE THIS HOLIDAY SEASON. Sorry to shout. But seriously, how else am I going to get you to take these delicious and amazing cinnamon pecans seriously? I have made these so many times in the last couple months, I’ve lost count. Not only are they ridiculously easy to make (and I’m not just saying that), they make the perfect snack to set out for little get togethers, football games. AND, they are crazy good coarsely chopped and thrown on a salad (like my favorite amazing spinach salad). A longtime MKC reader, Teresa, graciously sent me this recipe (and gave me permission to post it) a few months ago. Teresa makes huge batches of these pecans and gives them out as holiday gifts every year. I have no doubt she has people clamoring to be in her “friend circle” just to get a bag of these delightful pecans in December. Once you taste them, you’ll understand. 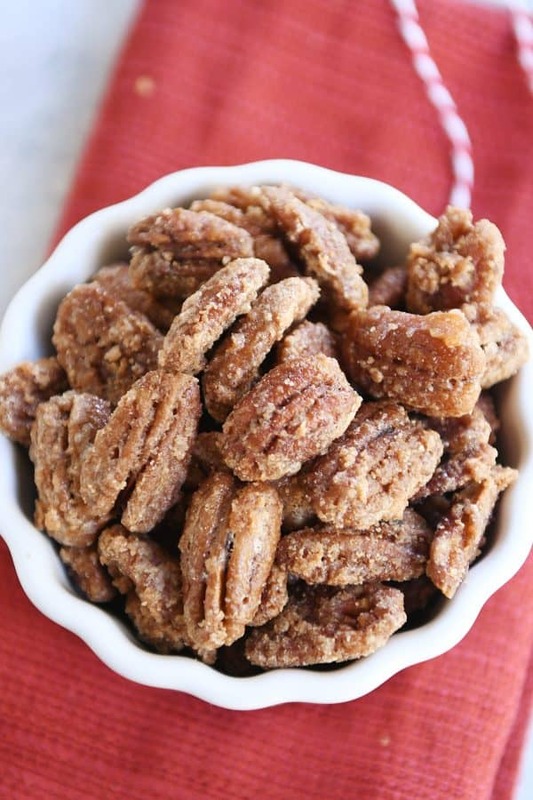 These easy cinnamon and sugar candied pecans are fabulous. I’m not someone who generally craves pecans or other nuts. In fact, I’ve spent a lot of time detailing my disgust of why someone would put nuts in my favorite cookie or brownie (although I have made a lot of exceptions for nuts over the years, so maybe I’m maturing a little??). But there’s something about these buttery, sugary, golden, roasted and candied pecans that have me literally throwing them out my door to every person who will take them so I don’t eat the whole batch (again). If you’ve ever walked into Cabelas or past one of those kiosks in the mall and been knocked off your feet by the magical aroma of roasted, sweet nuts wafting towards you, you’ll understand the emotion that may fill your heart while these cinnamon pecans bake in your oven and fill your house with a smell no candle or melting wax can ever replicate. Plus, you won’t have to sell your firstborn child to afford buying a bag at the mall. It’s definitely cheaper to make them at home! Years ago, I posted this recipe for candied cinnamon and sugar almonds, and I’ve made them on and off again over the years. Tasty and festive! But today’s pecan recipe is less fussy (and even more delicious). 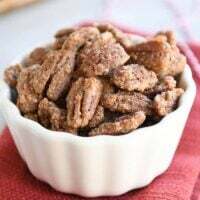 This cinnamon pecans recipe has skyrocketed to my favorite candied nut recipe ever, and I, like Teresa, will be making them year after year! The addition of butter to the recipe changes everything. It lends a caramelly, warm note to the sweet, cinnamon pecans that is extraordinarily delicious (and pretty much dangerous). Can I Use Another Kind of Nut? Yes, I think so! I’ve only ever made this recipe with pecans because they are one of my favorite nuts, but you could experiment with almonds, cashews, walnuts, etc. Is There a Sweet and Spicy Version? 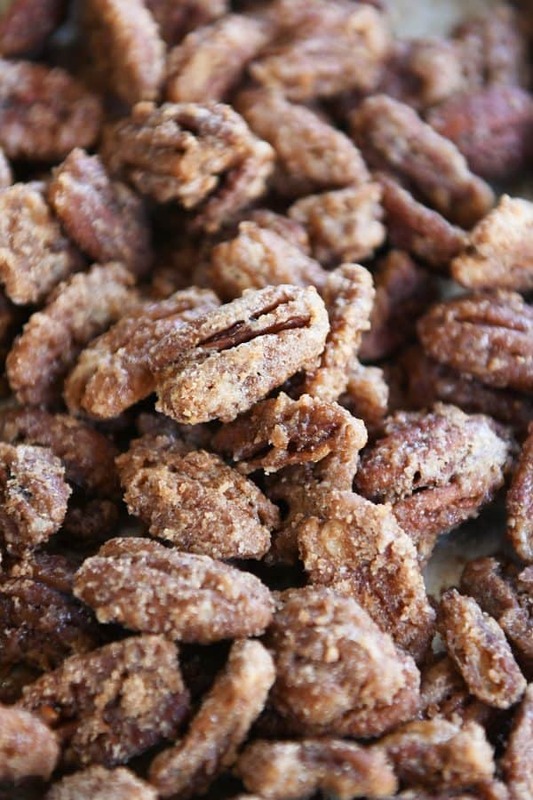 If you want to add a little heat to these sweet, candied pecans, I wholly support you in this! There’s something about that sweet and spicy combo that is fantastic on candied nuts. Add a pinch of cayenne pepper with the cinnamon (more or less to taste). And then try to find it in your heart to share any of the finished batch. See How Easy It is to Make Them Here! Melt the butter and spread on a rimmed half sheet pan (11X17-inches). You can also cut the cold butter into cubes, place on the sheet pan, and pop in the oven while preheating to melt the butter; just watch closely so it doesn't burn. In a large bowl, add the egg whites and salt and whisk until foamy but still liquidy, 30 seconds or so. Add the sugar and cinnamon and mix until well blended and the cinnamon is completely mixed in. Add the pecans and gently mix until the nuts are well coated, making sure to get underneath to the bottom of the bowl as you mix. Spread the pecan mixture in an even layer over the melted butter in the pan. Bake for 10 minutes. Remove the pan from the oven and using a flat metal spatula or similar tool, quickly stir the pecans and spread them back into an even layer. Bake for another 10 minutes, stir again, and spread into an even layer. Bake for a final 5-10 minutes (watching closely!) until the pecans are sizzling and lightly golden. Remove the pan from the oven, give the pecans another good stir, scraping them up from the bottom of the pan. Spread them into an even layer and let them rest on the pan for 1-2 hours WITHOUT STIRRING AGAIN until completely cooled and the sugar coating has set. The pecans keep for up to a week well-covered in a cool, dry place (not the fridge). I have only ever made this recipe with pecans (because they are sooooo good), but you could try experimenting with other nuts: whole almonds, cashews, walnuts. For a sweet and spicy version, try adding a pinch of cayenne (more or less to taste) with the cinnamon. I love this kind of nuts and always have a hard time resisting them when I am somewhere they are being sold. I woke up this morning and thought about my day ahead and wondered what snack to make for the day on the road and sitting at games…. this recipe immediately came to mind, I never took time to make them during the holidays with all the other cooking and baking I was doing then….. So I made 2 batches of these this morning to take with us to snack on while we watch our boys play basketball in Ogden and SLC all afternoon and evening! Simple, Amazing and Delicious! Thanks for this awesome recipe! I think I may have just made the whole day for myself …. and my family!! Delicious sweet roasted nuts for the WIN! And it didn’t cost me $20 for a tiny little bag, Iv’e got 2 pans full of nuts and I had all the ingredients on hand!! These are so good! I made a lot of people happy this year! Everyone raved about them and asked for the recipe! My favorite treat this Christmas! Thank you!! I used almonds only, turned out great! Making more tomorrow! Thanks! Another great recipe from Mel! I had to hurry and get the first batch packaged up so they wouldn’t get eaten. Nothing about this recipe was hard, but you’d never know by the result. 🙂 Thanks! Soooo simple…had everything on hand. So fast! We keep sneaking these off the pan even when they were hot. But we managed to have some left to give away and some to keep. I’ve gotten multiple comments on their amazing deliciousness. Definitely need to make another batch!! These were so delicious! Much like the ones you buy like you said, at places like Cabela’s, but much better! They were less sugary to me which was great- you can still really taste the pecan which is SO good! I’m making these as little gifts for coworkers and a family gathering. I had totally resigned myself to buying Starbucks gift cards for teacher/daycare gifts this Christmas until I saw this. Thank you for the easy, tasty recipe! Um, wow. These are fantastic. I had pecans, almonds, and cashews, so I threw them all in together and I’m having a really hard time deciding which one I ended up liking best. They are all just so good. Thanks! I LOVE that idea of doing a mixed variety of nuts. Yum! I think I may have a problem…. I have made this so many times in the last week that I have used three (yes, three!) entire Costco sized bags of pecans….. You may also want to consider starting a support group for this. I made these over the weekend and they are truly amazing! I always assumed something like this would be complicated (I’m not sure why!) but they are so easy and so delicious. I was hesitant because, let’s face it, pecans are not cheap! I was so surprised at how well they turned out. Thank you, Mel, for yet another amazing recipe! AMAZING! I had to make myself leave the house during the two hour wait because it was too tempting to dig in early. When I got home, oh my, I almost started singing when I ate that first pecan. Haha, I hear you! No self control around these things! I’ve made many of your recipes before, but never commented. Just wanted to say, these are amazing, so easy, and I’m looking forward to giving them away to my co-workers (although I’d love to keep them around, they’re a dangerous vice!). Thank you! Hi, how long is the shelf life of these once made? I was thinking of bagging them up and having them on hand until Christmas to give to people when they drop by with treats. Would they last for a month or so bagged up? Thank you!! I haven’t had them around for a month to know if they get stale or lose crunch or flavor, but I think they’re definitely good for 1-2 weeks if kept well covered and in a cool, dry spot. I really love this recipe. I worked for years at a movie theater and made these day after day from kits from the Nutty Bavarian and sampled my fair share, and I can say these are basically identical in quality. I want to try adding a bit vanilla since that is what I would use at work and I think that would make them just exactly perfect. I’m so happy these lived up to your expectations! I bet a touch of vanilla would be amazing! Hola Mel!! Muchas gracias por la receta, es delicioso y muy fácil, no sé cocinar, sin embargo éstas nueces, me quedaron deliciosas!, ojalá tengas más así de sencillas. Made these with almonds, they were amazing, will definitely double the recipe next time! So happy they worked out great with almonds! Thank YOU so much for your enthusiastic blog post, exclaiming how easy and good these are. Just so you know, I added some vanilla and they turned out perfectly. Your video is well done, so I felt confident in making them. Perfect! I’m not going to make them with a big bag of almonds that are in my freezer! Thank you so much! So happy to know they turned out so well! I made these yesterday – half recipe (just me) and added a bit of cayenne as well. YUM!! I almost didn’t try this as I made another recipe with the egg whites that I did not like as well as your skillet version (one of the salads). BUT, the other recipe had twice as much egg whites. This ratio: 1 egg white to 2 cups of nuts, is perfect! Ok, so no toasting the nuts beforehand? I made these today after walking through the Dickens festival in Utah this past week and smelling the exact scent I knew my home would fill with if I just made this recipe. . . And. . . They are even better than I sampled at the festival! They are dangerously, addictively delicious! I’m so happy to know how to make these! Thank you! Thanks so much for letting me know how they worked out, Meg! So happy you loved them! I didnt see any vanilla in the cinnamon and sugar nuts. Woukd vanilla be ok to adf? I haven’t tried it, but you could definitely experiment. Would you be willing to post a link for the metal spatula you used in the video? Thanks! I made these last night and they were amazing! I couldn’t stop eating them and had to send them to work with my partner this morning. Thank you! Thank you, Mel! The new video is amazing!!! Oooh, these look scrumptious! I too have a candied pecan recipe that I hand out to neighbors and friends this time of year. I just might have to make these too and mix it up, LOL! I have made something similar to this, almonds are delicious as well as pecans. I package these in plastic disposable icing bags and tie with something decorative like a mini ornament . They look like those conical bags of almonds at fairs and carnivals. Ummmm….wowwww! These are so good!! I really only made them because I had 2 leftover egg whites in the fridge from making your thin mint cookies yesterday (doubling your recipe I needed 2 yolks). I also had the big bag of pecans I bought a few weeks ago from Costco.. So I took it as “meant to be”. Well thank you fate because these are so good, so easy & perfect for gift giving. The video really helped me know I was doing it right. Thank you Mel!! Erika! I’m so happy you made these so fast (way to be industrious and use those egg whites for a good cause!) and mostly that you took the time to comment and let me know. So happy you loved them! Thanks for letting me know! Mel, I am so glad you tried this recipe. I think you’re right that the butter makes them so delicious! And like I said, they are crazy addicting. So happy you love them!!! I seriously can not wait to make these!! Also, your sweater is super cute! Perfect green Christmas color. I am Vegan and can use vegan butter for this recipe. Do you have any suggestions for a substitution for the egg whites? Oh boy, I really don’t know. The egg white is really important for the texture as the pecans bake. You might try googling a vegan-friendly candied pecan recipe for stellar results. Maybe try aquafaba? (The liquid from a can of chickpeas) I’ve used it in place of egg whites before. I have these in the oven right now..I used Swerve in place of sugar, my hubby is diabetic…just did the first stir and they look great!! I was wondering how they would be with Swerve! Hope they turned out, Teresa! I’ve made a similar recipe for years, they’re always a hit! I love using half white sugar and half brown sugar. Do you use raw pecans or cooked and salted? In the video she says uncooked because they will do their baking in the oven! Hey Rachel – Jody’s right – I use raw, uncooked pecans. I’ll make that more clear in the recipe. Thanks so much, Misty! I hope you like this recipe if you try it! Excellent timing! I just bought a bag of pecans at Costco for pretzel Rolo candies and was wondering what I could do with the rest of the bag of pecans – bingo! Thank you! These will be excellent to have on hand just in case we have additional people to add onto our treat giving list! Let me know what you think if you try the recipe, Anna! I made these last night and they are delicious! I was going to add a dash of cayenne or chili powder in and forgot… next time, for sure! I made these and a third batch of toffee popcorn last night – my house smelled delicious! Thank you! Oh wow, I bet it did! Yum! Great video! You look gorgeous…..and, so do those pecans!!! These look amazing and I will be making them today!! Also my sister and I had an all things Mel day yesterday! (not planned) She made your slow cooker tortellini sausage potato soup and bread sticks and I made your shepherds pie, chocolate truffle cookies and corn meal dinner rolls! We both agreed that your food is so amazing! She also said “Do you think I could ask Santa to meet Mel for Christmas! ?” We both laughed and at the same time said “if only” *happy sigh* We love you as much as your food! Haha, you are so cute, Jen (and your sister, too). Sounds like a super yummy day yesterday! Wish I had been at either one of your houses instead of my own (it was one of those “everyone is sick, fend for yourself” scary kind of days). I make a spiced pecan recipe pretty similar to this — my grandmother’s recipe. I use them as teacher gifts and they are always a hit! Now I just need to get on it. I bet the teachers love them! Great idea!